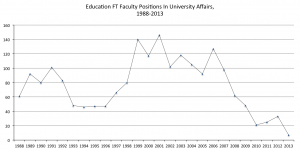 Oftentimes, the academic job market for full-time (FT) faculty is inversely related to economic recessions. Not anymore. In this prolonged Great Recession, turned Great Depression II in parts of North America and across the world, youth have been particularly hard hit, more pronounced by race. The most common description for this current economy for youth is “a precipitous decline in employment and a corresponding increase in unemployment.” In Canada and the US, unemployment rates for the 16-19 year olds exceeds 25%. At the same time, one of the most common descriptions for postsecondary enrollment and participation in Canada and the US is “tremendous growth at the undergraduate level… the number of graduate students has grown significantly faster than the number of undergraduate students over the last 30 years.” With “school-to-work” and “youth employment” oxymoronic, corporate academia and the education industry are capitalizing on masses of students returning to desperately secure advanced credentials in hard times, but no longer does this matter to the professoriate.